Map Design Video Tutorials. Find Help and Support here on how to use our tools or download and use our files. We’ve created a few short video tutorials for users of our Map Colouring System and for people who want to use Adobe Illustrator to edit original vector map artwork files downloaded from our site. The videos are short and concise to the point, they are pretty much a recording of what we say and get you to do on the phone when you ring up to ask how to use the system. Try Our ONLINE Software now for free by selecting one of the green buttons below or try The New Mapping System Here. Try our uk postcode area mapping tools to colour a UK Postcode Area Map (the first 2 letters of the postcode) into different zones. 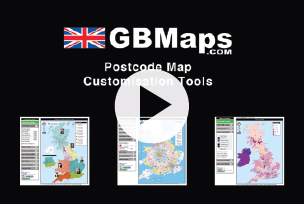 A very quick and simple video showing the features of the postcode area map colouring tools. Covers the basic features of the tool which are common across all of the maps available. You can create a UK Territories map in less than 5 minutes. How to colour in a UK postcode districts and area map using our map colouring tools. The same features as the postcode area map with a few extras specifically for the more detailed postcode districts of the uk (the first 2 characters and first 2 numbers in the postcode). Ideal for maps where a postcode area is too large and needs to be split across two or more different zones. Most of our postcode map files bundles come with a uk postcode PowerPoint map included. This is a short video on how to colour the map into zones using Microsoft PowerPoint. Some of the very detailed maps we sell don’t come with a PowerPoint file as PowerPoint isn’t able to deal with the high level of detail. This is clearly shown in the package contents section below each option. A very quick tutorial on how to open and edit one of our postcode maps using adobe illustrator. Once you’ve purchased a a postcode or county map package of files, this shows you how to open and do very simple map editing using adobe illustrator. You can download a copy of illustrator to trial for free for 30 days from the adobe website. Our USA zip code mapping tool works in the same way as our postcode mapping tool apart from the orientation of the map which is landscape. The key to the map is at the bottom of the page rather than down the side as it is with the UK postcode maps. 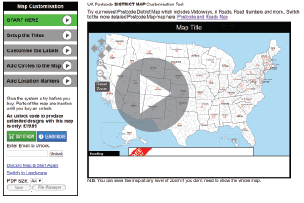 Our USA zipcode and state maps have all the same features and functionality as our other maps. We've developed a totally new suite of online postcode map colouring tools which are much faster, feature rich and easier to use than our older mapping software version. Its fully functional and linked to from our home page however it's in early stages of release so there maybe a few small bugs still present. (It's been in testing for 9). I made a purchase but never received a confirmation email. As soon as you’ve completed your purchase, the same piece of code that takes your payment immediately fires off an email to the address you supplied when paying. If you don’t receive it in your inbox within a few minutes, it may have been filtered into your junk folder. You made a mistake when entering your email address or your anti-spam software completely did away with it. It was definitely sent though. I enter my email address into the system and it says i have No Credits. This can happen when you use a different email address to the one that’s registered with your paypal account, which is the email address to use. You maybe trying to unlock a map that you haven’t purchased access to. Make sure you are on the correct map page before trying to unlock it. You may have been using the system very heavily in a short space of time, tell us and we will reinstate your credits. This is to combat machines setup to abuse our system, no genuine customer should be concerned. Watch the short video on the Help page that corresponds to your purchase. This will guide you through the simple steps required to start building your own maps. Hundreds of maps are produced each day on our site. The chances are that something is incorrectly configured on your computer. First thing to try would be to download and try the system using Google Chrome, this is the most stable web browser we can find that runs the system perfectly. Internet Explorer can be quite buggy on older systems so try and give IE a miss if you can. The system runs very slowly. Our site is hosted on its own dedicated web-server with 100% uptime. 4xCPU’s, 6gb RAM, 65GB SSD storage and 650GB/monthly bandwidth capability. It is most likely that your internet connection is very slow. Try using a different connection if possible, connect using a wifi hotspot on a 4g phone or use the system on a machine with a faster internet connection. Any other questions just give us a call or drop us an email, we’re here to help you get the most out of our products.